Senior Care St. Louis MO |In Home Elderly Care St. Louis. Most wish to continue living in their own home. Sometimes this can become a concern for safety in day to day activities such as climbing stairs, laundry and other tasks. 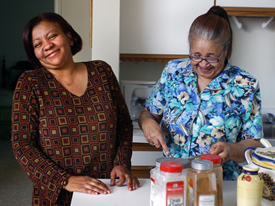 Senior Solutions provides for the needs of older adults and their family caregiver. Senior Solutions offers lifestyle options that enhance health and independence, ensure safety and minimize concern. A comprehensive array of support, nursing and specialty services is available and can be customized to meet individual needs. Whether it's a little extra help managing home maintenance, assistance with errands or medication management, Senior Solutions is here to help.